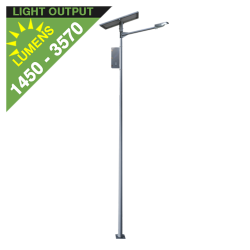 This solar powered street light is available with several different options including a 10 Watt (1450 Lumen), a 15 Watt (1904 Lumen). a 20 Watt (2866 Lumen), a 25 Watt (3025 Lumen) or a 30 Watt (3570 Lumen) LED lamp. Sold as a complete system. 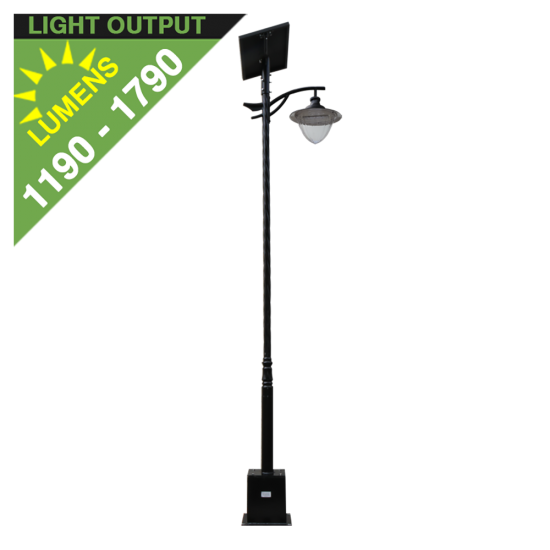 Easy to install, affordable and ideal for illuminating small streets, public spaces, parks, courtyards, malls, open areas, communities, HOA's etc. Choice of lamp configurations. Prices from $1699.99. 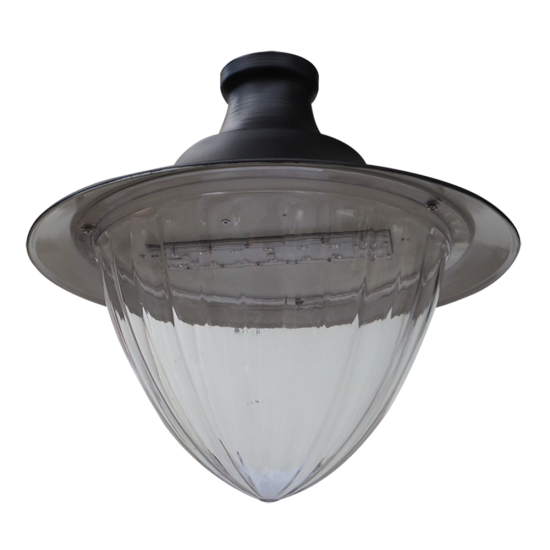 A popular choice for anyone looking for a more attractive, decorative, more traditional styled solar street light. It's available with a choice of solar panel, battery and LED bulb options. 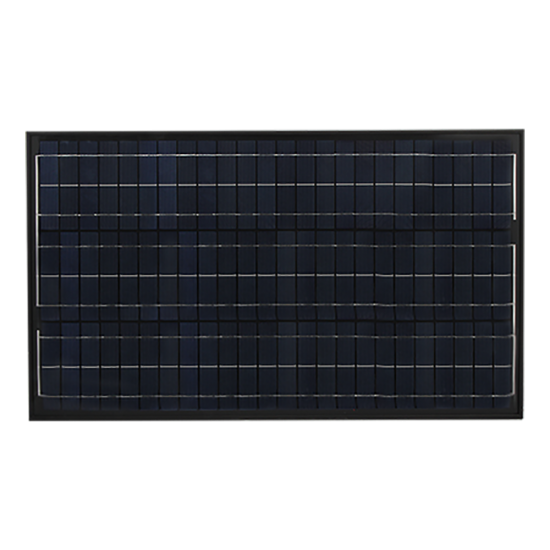 Select from either a 90W, 100W, 180W, or 200W solar panel. Select either a 10W (1,450 Lumens), 15W (1,904 Lumens), 20W (2,866 Lumens), 25W (2,980 Lumens) or 30W (3,570 Lumens). Alternative power options are available by special order from 1W to 30W in any 1W increment. 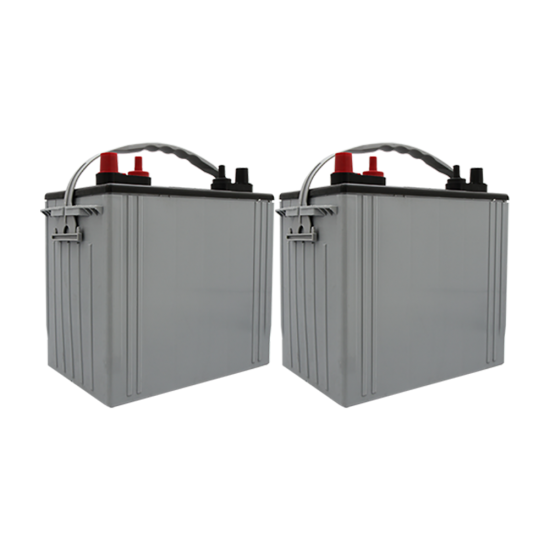 A heavy duty, lockable battery box is supplied to facilitate the batteries. 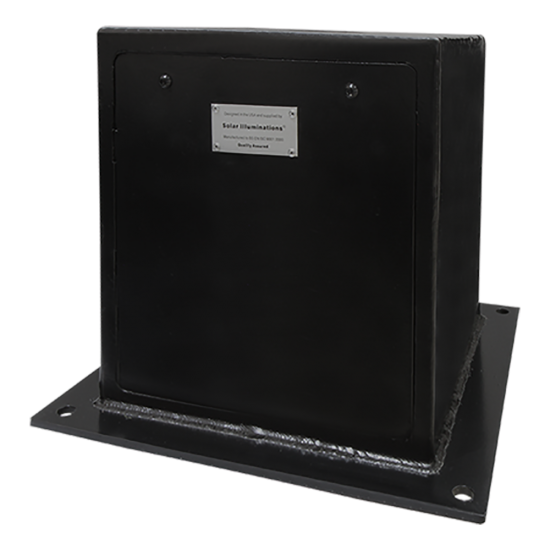 The battery box will anchor to a concrete footing with the supplied anchor kit and templates. When the pole is installed, standing on top of the battery box, it is about 17’ tall. 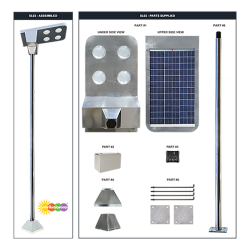 The solar panel attaches to the top of the pole and comes complete with a support arm allowing it to be secured at the correct angle and direction. 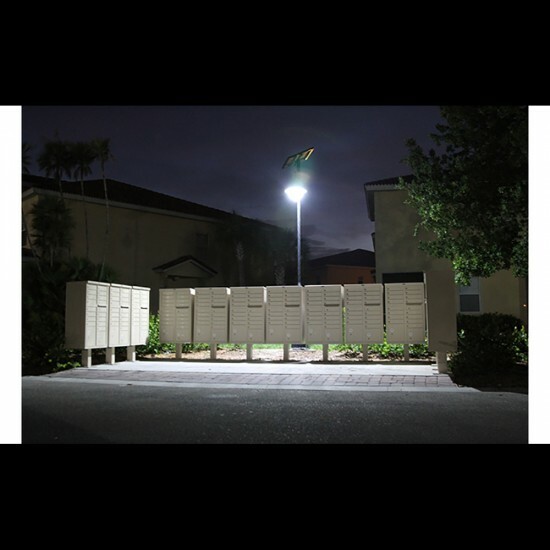 Most of the configurations that we offer will typically allow dusk to dawn illumination but may be subject to your geographic location, LED Wattage and solar panel Wattage selected. These configurations may restrict the illumination time depending upon the final configuration. The light will come on automatically at sunset and will stay illuminated for the programmed amount of time. The control module can be set to run dusk till dawn, or run for a set number of hours after sunset (from 1 to 12 hours) and then turn off. It can also be set to operate for a chosen amount of hours after sunset, turn off, then turn back on again for a chosen amount of hours before dawn. Dimming the light for any period at any percentage is also an option. Delivery costs will vary and are subject to quantity, size and weight of shipment as well as delivery address. It is perfect for lighting up small streets, walkways, parks, open areas, playgrounds, public areas, etc. Ideal for HOA communities and sub-developments, private estates, sidewalks, outdoor malls and such like. It can be used for residential or commercial applications. Operating voltage is either 12v or 24v. DC. White is approx. 5,650to 6,300k. The 20 Watt lamp unit provides 2,866 Lumens. 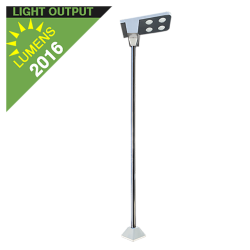 The 25 Watt lamp unit provides 3,025 Lumens. 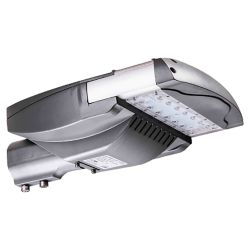 The 30 Watt LED lamp unit provides 3,570 Lumens. Battery capacity options are 18 A-Hr, 32 A-Hr, 55 A-Hr per battery. Configured as either a 12v or 24v dc system. Typical battery life is approximately 3 to 5 years subject to environmental factors. 90W & 100W solar panel dimensions are approx. 40.25" x 26.25" x 1.5" (112cm x 99cm x 3.5cm) L x W x D.